This map is quite good. love the moving screenshot. i can only find one problem with it. When in eitheir med facility there was an invisible barrier blocking me. Other than that it is really fun. My fav is the armory with the sniper rifle. it is very useful on this map. I am what you guys consider a nice commenter. I rate the map on the play time and fun of the level, and also flow, not as much on bad usage and misplaced items. i cant even create a mover, so thats good for me with the doors. I never really noticed anything bad except for a couple texture misalighnments around the center wall but thats normal in every map. I think that the author did a good job!. But the bots have big problem in there, only one strait way to the flags. The mouvers have some problems. Some brushs are not ok, and I could go on. But like I said good job! brushes, 3 homs and a few textures out of line. the author hasn't taken advice from any of the comments made on the other mountain base!! It was okay but nothing special. I dunno,is it me or..I didnt see the flags there just 4 health vials. instead of having to rub your nose on the door. beam me "ouch" up scottie hehe. As far as the HOM I didnt see any but up by one light texture in the long hall,Also you don't need a zone there for the very small water thingy to small to barely get in.Nice plan for your med room healing zones.Another thing is ware your floor or cielings change texture,put some kind of thin brush to have the texture have flow instead of an abrupt texture change,look much better.Also mess around with "intersect" and "deintersect" that will help on smooth brush seems. As far as "CTF" I would shrink the length down a tad and add a left and right passage as well.Instead of a bullrun for all.And you dont need that many pathnodes for the simple floorplan,reduce those by 1 half and zig zag them down the hall a tad.And you dont need as many right by all the player starts either,they are pathnodes allready. Also the pit,why have a zone at the bottom? just add a "triggered death" and increase the radius to cover the area,also just use a trigger for the text,the more zones you add the more funky things start going wrong with HOM and invisible collision probs.You will regeret using zone when you start making more complex maps. I didnt see all this bad texture allighnment,but if so you know what to do for that.Possibly make those lights textures on the cieling "unlit"
Oh i did'nt try your other map,the screenshot was freakin me out to much. 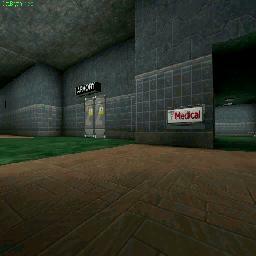 And how or why are you nameing the map name this,"CTF-Keson mountian Base"here,then when I want to play,it's this "Ctf-underground2"? all thats going to do is get people confused. And whats up with littlebunny scores,mabye he thinks it goes to 100 ?,Mr Littlebunny ! not only does it make you look kinda goofy,it really does'nt help the mapper evaluate how they did.It's better to leave NO score and comment than leave a misleading score.for the viewers as well. good improvement , keep it up.